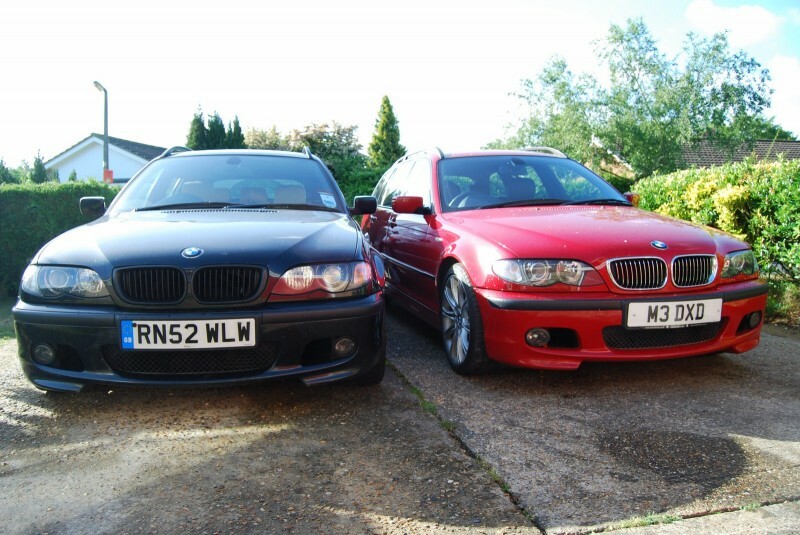 I’m currently lucky enough to have an extra 330d sport touring on the driveway, as it’s half way home to its new owner. It’s a year younger than mine, which means it’s the 204hp 2,993cc unit with a 6 speed gearbox; mine’s a 184hp 2,926cc 5 speed effort. It’s finished in Imola red, which was my first choice colour (I settled for black). This article was originally intended to represent my thoughts based on these comparisons, but as I was photographing it quickly became clear that it would also cover a list of my customisations, as the red car is absolutely in stock condition, while the black car has now been in my possession for over 5 years. I’ll cover the cosmetics first, and come around to the driving experience at the end. It turns out that my tractor was very much between the two E46 revisions, in that it had the facelift body but not the newer wheels, engine and gearbox. 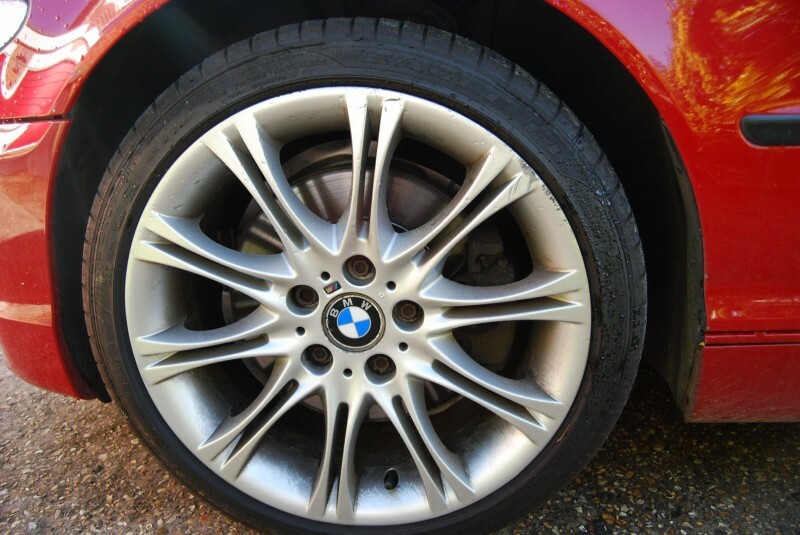 The wheels were rectified a while ago, but of course the other elements remain. The point is though, that colour aside these two cars look the same. So, red. 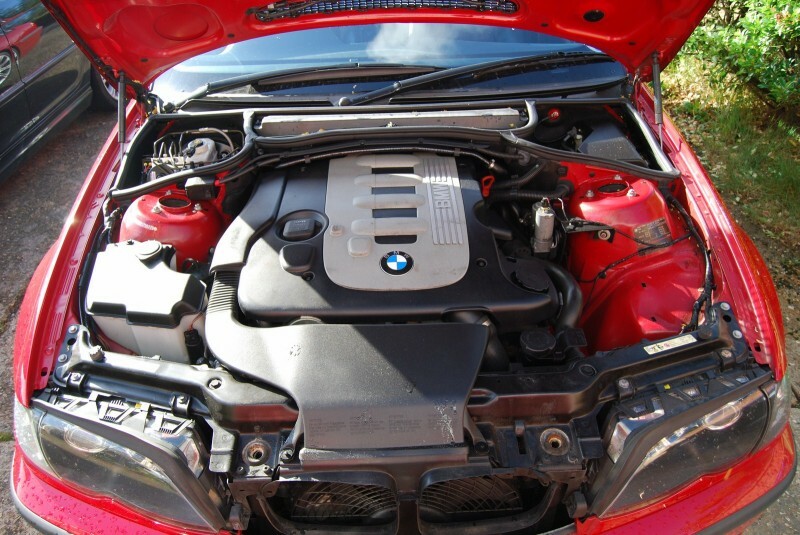 It’s not a colour I’d usually choose, but BMW’s Imola red with black trim just works for me. 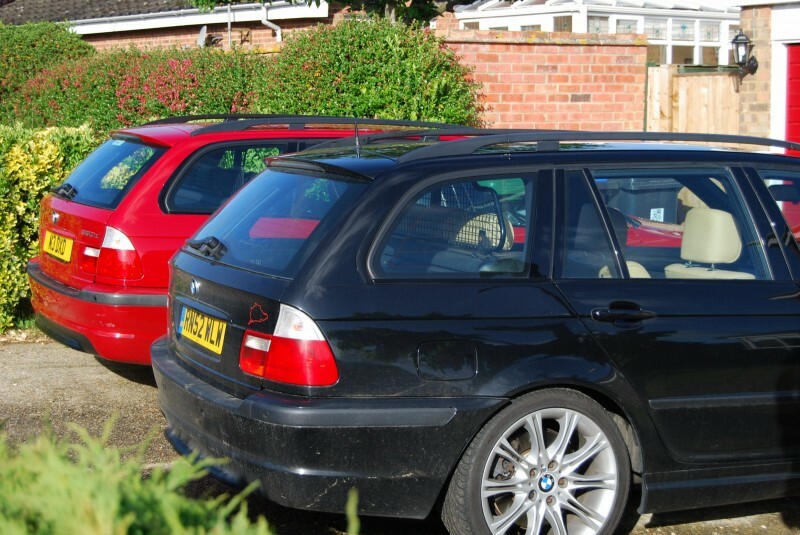 My last 4 BMWs have been black (or near enough; the M5 is a very, very dark blue), and that’s been far more about the car’s other attributes than a concious colour based decision. Oh, please ignore the tragic plate – the new owner will be removing that promptly, at which point it’ll revert to its 53 plate. 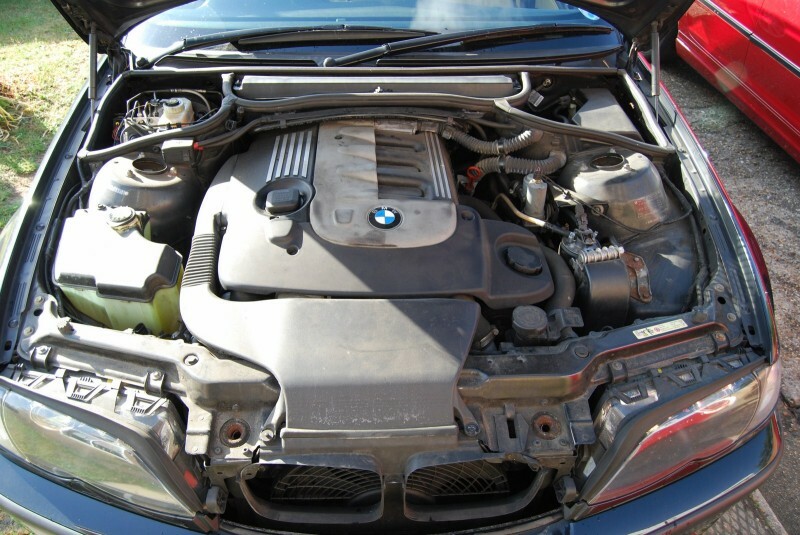 Anyway – the first customisation is most apparent there: the black kidney grilles. Given that both these cars have the black shadow gloss option, which basically means that the chrome trim around the windows is replaced with a black gloss effect trim, in my view the chrome kidneys look a little out of place, especially on a black car. Under the bonnet there’s a slight difference in the engine covering but in this case the real difference is how filthy my engine bay is. 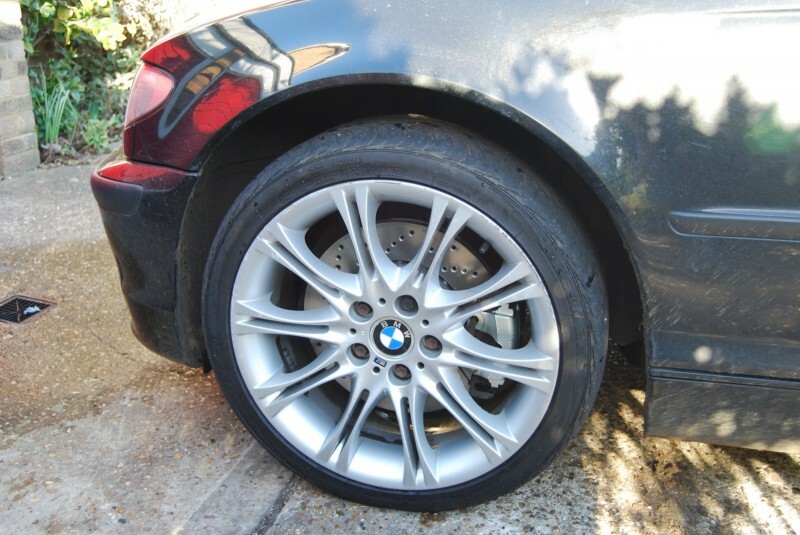 The wheels, as mentioned, are the same, but of course the black car is sporting those floating and drilled brakes. Moving to the boot, the most obvious difference is the significant amount of dog hair and general filth I carry around with me everywhere I go! More seriously though, the red car lacks navigation. 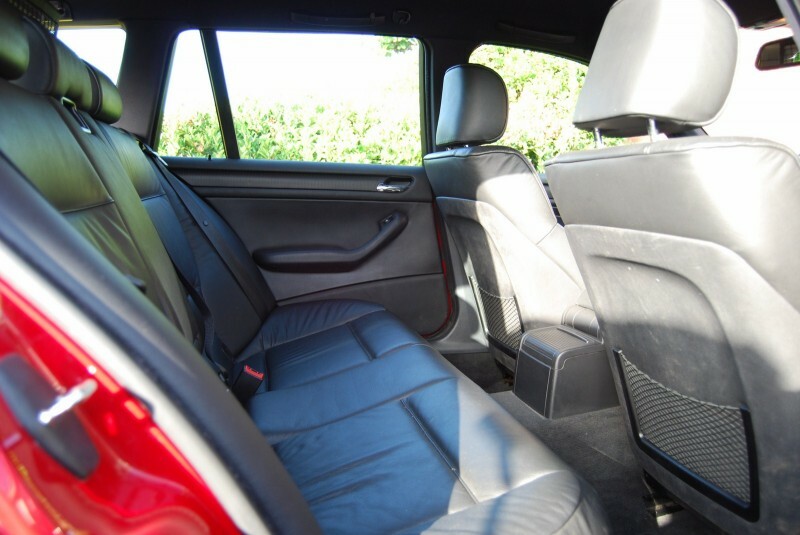 This is the only thing that it lacks that my car doesn’t also lack – sunroofs and heated seats would be nice too. 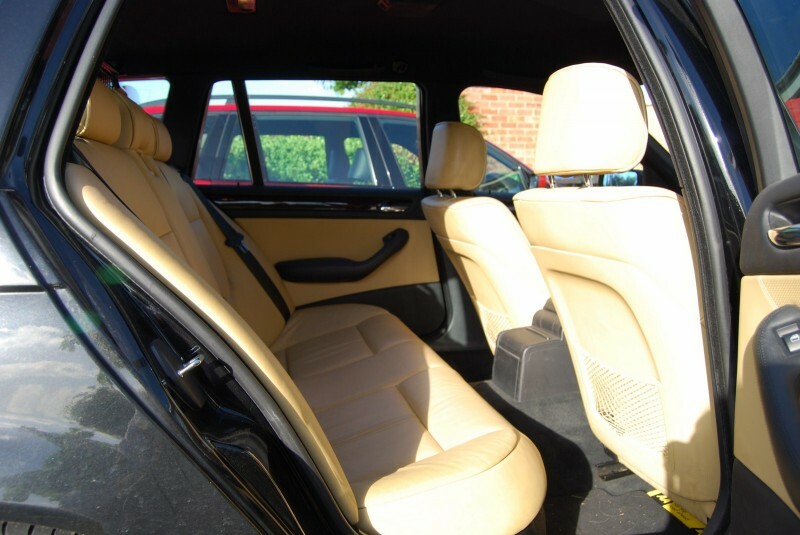 Ian (the red car’s new owner) seems quite keen to retrofit heated seats to his, so perhaps that’s something I’ll get involved with too. So yes, rather hairy. 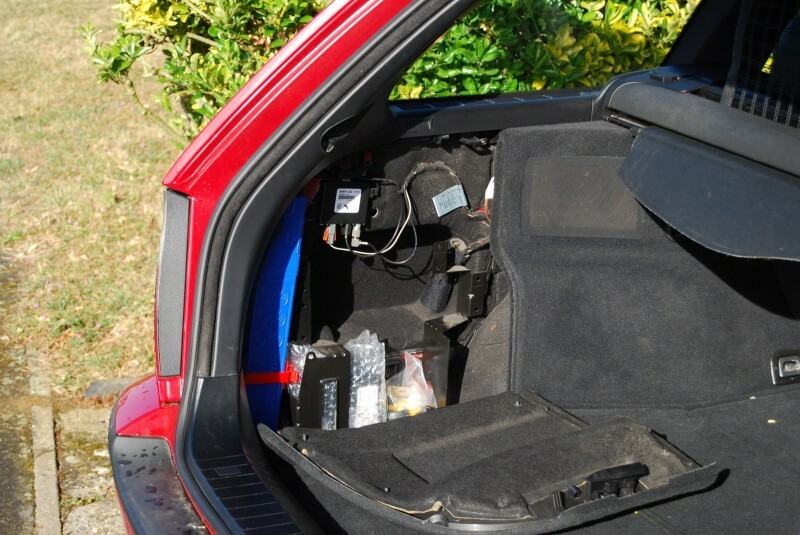 The sat-nav computer is the factory difference, but there’s also the DVD movie player and an inverter present in that cubby hole in the black car. 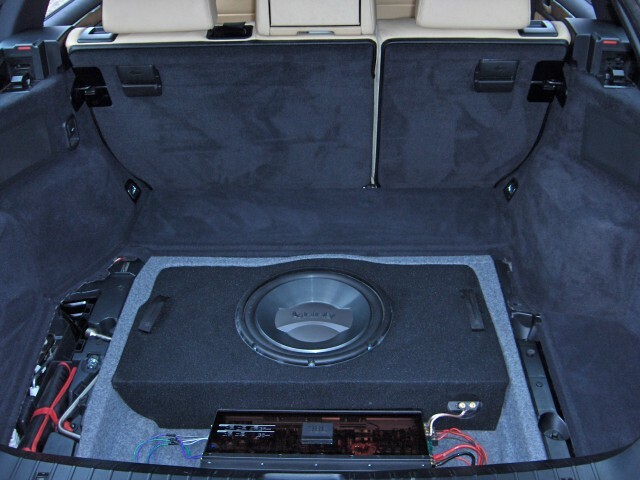 This photo also neatly highlights the 6×9 speakers I fitted in the rear. 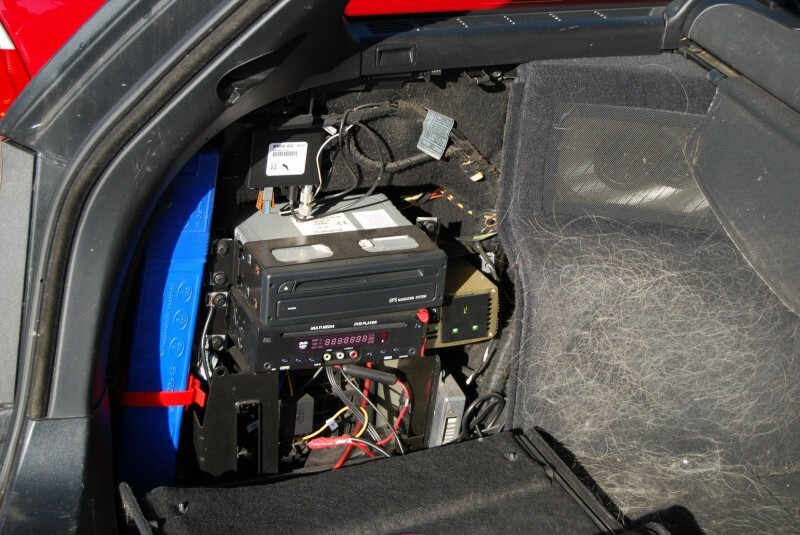 Cars with the Harmon Kardon audio upgrade pack (neither of these cars has that) have a larger basket in the rear to accomodate 6×9 speakers, and before the days of this blog I got hold of some of these baskets and upgraded the rear speakers. The result isn’t much to write home about, but these photos make it really obvious. Under the boot floor I was again reminded of how a standard car should look. I’ve dug out an older pre-dog photo of my car for this comparison. Bling bling mo-fo! There’s no detachable tow-bar on the red car, but the black car has the tow-bar stowed under the circular cover in the lower boot floor. Remaining in the boot area I’m reminded of another customisation – the metal dog guard. I’m so used to this I had to pull the luggage net up in the red car to make myself feel more at home! 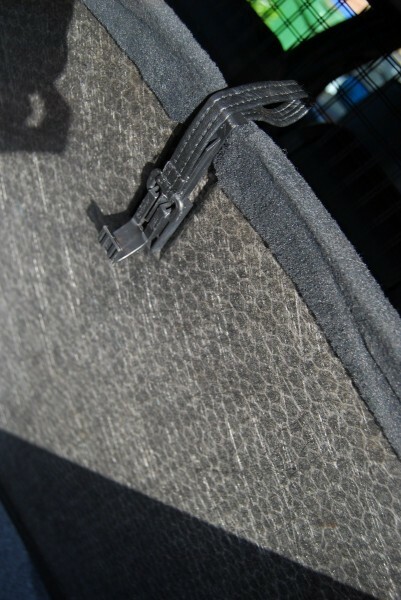 These cars have a leather tag connected to the boot floor that ends in a plastic clip – handly for lifting up the boot floor and hooking it in place if you need to get under it. I’m especially good at leaving this dangling out over the boot lip, and then slamming the boot lid shut on it shattering the plastic hook. 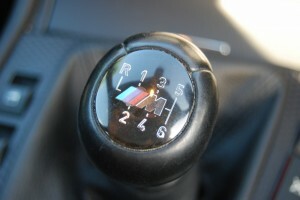 The average life expectancy of one of these in my car is about a month. 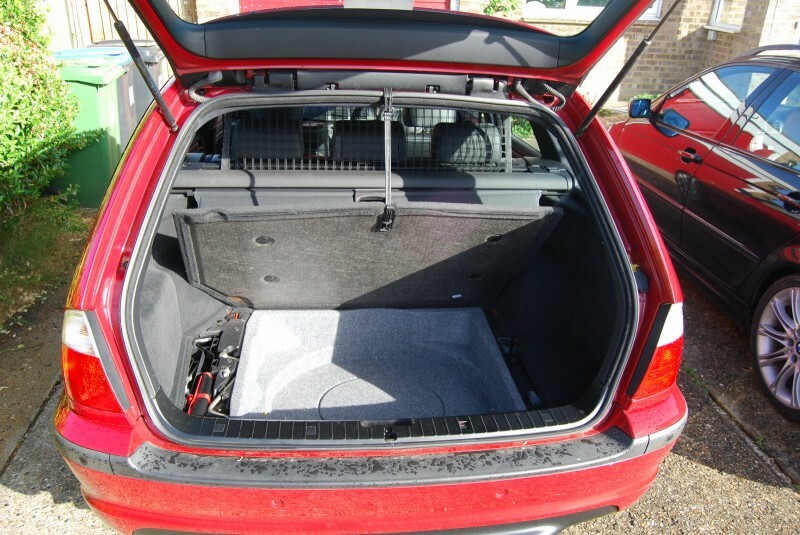 However yesterday I learnt that they can be neatly stowed in a way so as to protect the plastic clip under the boot floor, while still exposing the leather hoop to permit the boot floor to be easily lifted, look! Moving on to the interiors, we once again return to the question of colours and taste. 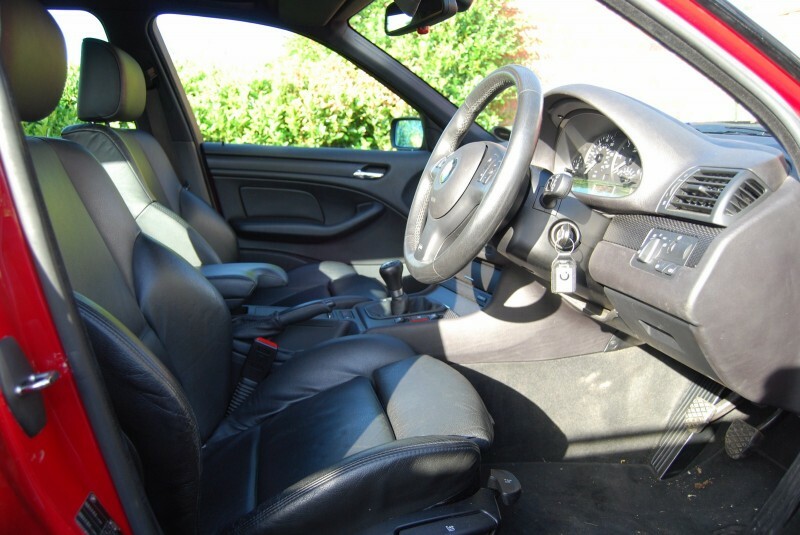 You see, while the outside of my car is a nice safe black, the inside really isn’t. It’s yellow. A fairly bright yellow at that. I’m not going to lie, I really wasn’t sure about it at first. It’s certainly a bit refreshing. 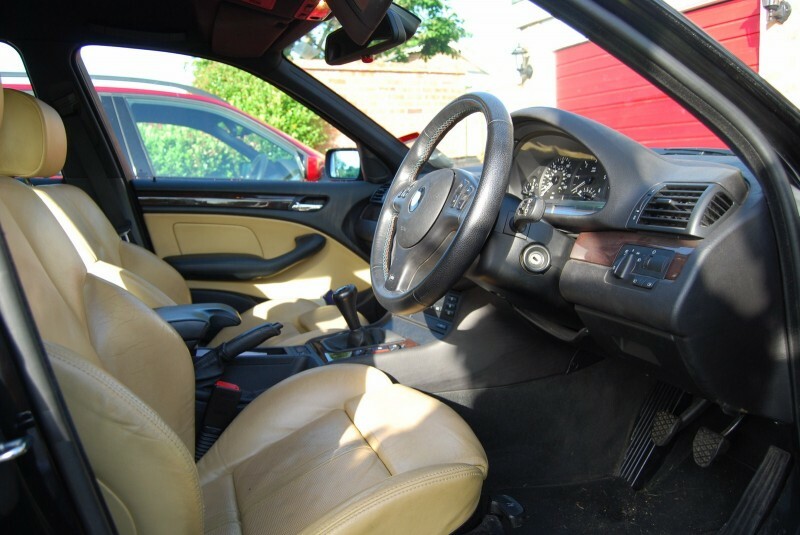 I would say that the E46 interior is exceptionally hard wearing. 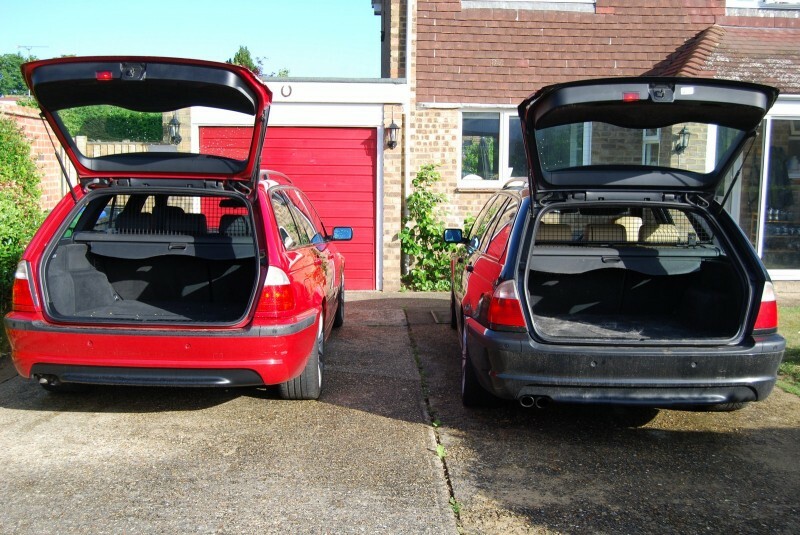 The red car has done 113,000 miles, the black car 130,000 miles, yet neither looks like it has suffered anything like that kind of use. 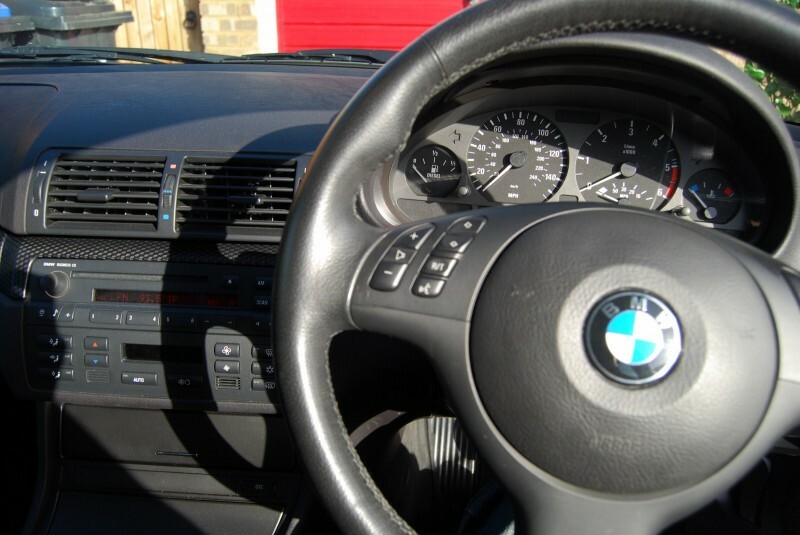 Moving to the dashboard, we start to see the first signs that all is not the same under the bonnet. 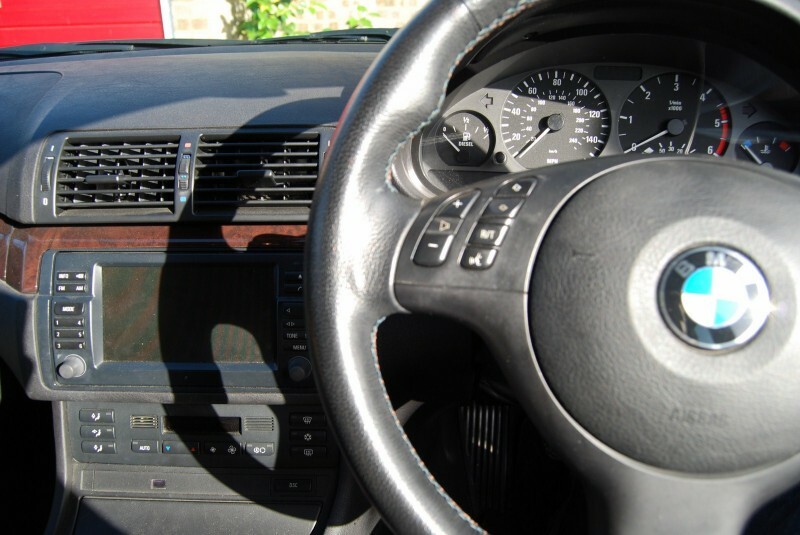 Note that the black car, with nav and the older engine, red lines at 4,500rpm, where the newer car red lines at 5,000. I’m sure that’s a rather basic view and that more specific details may show less of a difference, but it is an indication that translates to the driving experience. The newer engine seems to drive slightly more like a petrol – the power stays accessible for a little longer before melting away. The older engine by comparison is marginally weaker up the top, but my fettled version at least provides a touch more grunt down at the bottom end. The newer car comes with a six speed box, something I’m especially familiar with from various M cars and this is the single feature that has generated the most tractor envy! The whole package adds up to suggest to me that the newer car is worth quite a premium over the old. I had the pleasure of piloting the new car from just north of Oxford back to Woking. There was a healthy section of bendy A roads, most of which was taken at a brisk pace, followed by the M40 tackled at typical motorway speeds. My 330d would have managed all this at around 40mpg while showing a clean pair of heels to most other vehicles on the road. 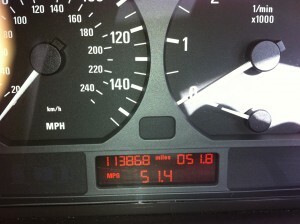 This 330d reported 51.4 MPG. Simply amazing given the performance. Priced to repair it was 70, But ive been told that leather repairs like that dont last long :[ and best to just do before i sell it on. Great comparison, Love the floating discs looks Great! Fantastic and deatailed comparison thank you for taking the time! I’ve just bought a 54 plate 330d Touring in blue and am totally obsessed. I expect ill be reading through the rest of your blog while I tweak it to perfection!